Valle de Las Lenas, located in the Mendoza province 1200 km west of Buenos Aires, is legendary for its extremely steep, above tree-line terrain, rocky chutes served from the famed Marte Chair, serious back country, and wide open spaces. The valley is barren and desolate in the winter, but if what you seek is massive snow covered summits, you are in the right place. Spectacular peaks dwarf the tiny group of buildings that form the village from every direction. The base area itself consists of little beyond lodging, restaurants, bars and discos. There is a small grocery store, a few little ski shops, gift shop, and a rental shop with less than up to date equipment (if you have your own gear, bring it). A number of lower mountain ski-lifts access mild open bowl-like terrain, and two upper lifts lead to more challenging runs like 50 degree chutes and rather technical areas. 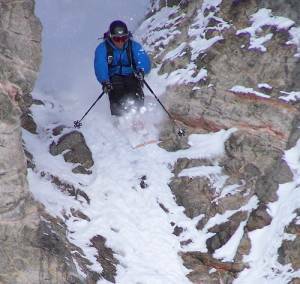 The resort also offers some limited cat and heli-skiing in the surrounding backcountry. North American and European skiers and snowboarders swarm the area during August and September. Gringos tend to take over a few bars, such as Rosa’s, and create their own scene amongst piles of cheap après-ski Quilmes beers. There are Argentine skiers, mostly from Buenos Aires, on week-long ski vacations, but it is definitely not the cultural experience of some smaller resorts. Basically, the program here consists of skiing, eating, sleeping, and partying. Make sure you throw a couple of dancing outfits in your ski bag, the discos here are famous, and for good reason. There isn’t much to do besides skiing and nightlife in the valley, but down in Los Molles, across the road from Jose’s, there is a hot springs at Hotel La Huenco. Here they provide you a towel and 10 minutes in a bath for $5 pesos. An abandoned hot springs resort on the other side of Los Molles sees many skiers relaxing for free. The ruins are very cool but beware that some of the pools are a bit skanky, to say the least. It is usually best to figure out your lodging before you arrive, as the affordable beds can go quickly-Las Lenas is not a place where you can get great deals anymore. There is no hostel near the base of the ski resort, but 20km down the road is Jose’s Hostel in the tiny village of Los Molles. Run by a local ski patroller Jose, this is a fun, cheap option and you can get tons of local information on ski touring and the like. Contact him at josehostel@yahoo.com, or call internationally +54 9 2627 600962. Most skiers find lodging at one of the many base area hotels or apartments, where offerings range from deluxe to cheap dorm style accommodations. If you have enough people, usually between four to seven will work, staying in the village can provide bang for your buck, but prices vary depending on the part of the season. Argentine style luxury is found at the Pisces and Virgo Hotels, then on to basic apartments in Corinto or Tebas, or dorm style at the Dormy Houses. Most of the apartments are privately owned, rented out in 7 day blocks, and handled by property managers such as Demartis. You can also contact ventas@laslenas.com, look on the resort website, or check out www.laslenasski.com. A few people choose to stay in inexpensive Malargue, but at 80 km away, it can be a tiresome commute. A car is not necessary in Las Lenas, but if you stay in Los Molles, it will make life much easier. Several major bus lines run daily service to Lenas and Los Molles from San Rafael, with intermittent service from Malargue. From Buenos Aires, the cheapest and most efficient way to Las Lenas is to hop a bus from the city’s mega bus and train station, Retiro Terminal. Located downtown, several major lines run this route and they are all overnight buses departing around 10 or 11 pm. If you have just arrived from Buenos Aires’ international airport, Ezeiza, you can store your gear cheaply at Pack-Guard in the basement at Retiro, explore the city for the day, and then catch the bus. All connect through San Rafael, and you will arrive in Las Lenas around noon the next day. Tickets can be bought online or at Retiro when you check your gear. Some people fly from BA to Mendoza, and then take a bus to Las Lenas. This doesn’t actually get you that much more ski time -about half a day- and is much more costly. If you are coming to Las Lenas from other parts of Argentina, you can usually find flights to Lenas, or, just take a bus to San Rafael and secure transport to Lenas from there. This page rendered in 0.636 seconds.